I'Onzi balancing rocks around the world. This is one of my greatest hobbies! Along with putting holes in clouds. 12 years ago while walking with my daughter at Wallowa lake in Joseph, Oregon something magnificent happened to me. 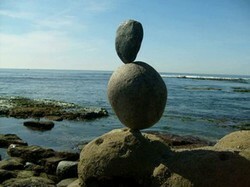 While walking on a shore of beautiful rocks a voice said to me, "Balance that rock.". I am a firm believer in "The First Voice." And so I picked up the fist rock my conscious saw. I kneeled down and began to balance a rock on top of another. As I was putting the top rock on top another, I felt the magnetism. I actually felt the two rocks pulling towards one anther! I then let go of the rock on top... AND IT BALANCED! It is quite difficult to describe the feeling I had. I can only compare the feeling to standing on the edge of a building thirteen stories high! I searched for more rocks to balance and balanced those also. Soon I had my own Stonehenge by the lake. I made thirteen monuments. Some three tiers high, some four tiers high! They were everywhere! I do not know where I learned this talent but it was amazing! After marveling the sculptures for some time I rushed off to get a camera from my home, six miles away. But I will first pick up my wife from work. I grabbed my camera, put the dogs in the car and went to pick up my wife. Upon returning I could see the monuments still stacked, still built. Whenever my wife and I bring the dogs to the lake they immediately run to the water and jump in, at full speed. This time when I let the dogs out of the car they quickly ran towards the rocks. About ten feet from the rocks they stopped and CAREFULLY went around the balanced rocks. Those rocks held a kind of energy in them. I put my hand above one of the rocks and it had a warm sensation coming off of it. They all had warmth coming from their tops, their tips. Today I utilize the art of balancing rocks to help with my Life Coaching. They help me find balance in my clients body frequencies. They also help me with Reiki practicing. Especially on horses. I have balanced rocks all over the world now, from England to South Africa. Balancing rocks!!! The picture does the justice, the miracles of Nature - I have to admit I am amazed. It's the best. The ultimate "First Voice" training. Interesting hobby. I may have to try it.